We’ve covered the appliance purchase process at length in this blog. Selecting appliances for a new house, upgrading existing appliances, saving money at our liquidation center, favorite appliance brands, etc. But today…if we haven’t covered YOUR reason to buy an appliance, we’re going to discuss the one reason to buy an appliance that is guaranteed to work for you! JUST BECAUSE. 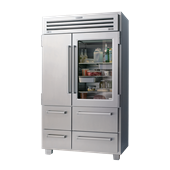 It’s OK. Really, it is OK to buy that Sub Zero refrigerator JUST BECAUSE. Just because you’ve always wanted to own a Sub Zero – Just because your best friend has one, and she loves it – Just because you’re long lost uncle died and left you an inheritance. JUST BECAUSE. Recently, I have become interested in photography and video. I’ve purchased a new camera as well as some new audio and video equipment. I could give you a list of reasons why I’ve spent more than makes sense on new cameras and audio and video equipment, but the best explanation is JUST BECAUSE. Now, for sure our sales associates might ask you why you want this or that appliance or flooring product. They’re trying to find out more about your needs and wants in order to do a better job of helping you. But never mind. It’s OK to answer JUST BECAUSE. And if that is the only reason you have, our sales associates with be happy to write up your order and take your money. We buy for our own reasons. We make lists of pros and cons, comparing brand and model A against brand and model B, checking the prices against the budget. Then we go into the beautiful design center at Arizona Wholesale and there it is. We’re in love. It’s just what we want, and we buy it. We may come up with a convincing reason that it is going to last longer, that it fits perfectly, that it was on sale, or that it will save money in the long run. You bought it JUST BECAUSE, and that is reason enough.